The eagerly-anticipated secret to the ultimate strobed glow, Huda Beauty's 3D Highlight Palettes boast four, beautifully buttery colours to make you best assets stand out. 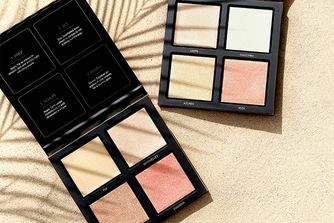 Ideal for exaggerating cheekbones, brow bones, collarbones... anywhere you deem deserving of attention, these must-have quartets are essential for all Huda-holics, as well as anyone who's hooked on highlighter. First, tap the Melted Strobe onto the high points of the face. Next, brush the lightest powdered highlighter shade on top of the cheekbones where the Melted Strobe was applied. Next, apply the darker shade under the cheekbones and brush the rose shade onto the apples of the cheeks. These simple steps are conveniently listed on the inside of the lid. I have the pink sandals palette and I'm seriously so glad I bought it! I'm quite pale and it gives to my skin such a healthy look... I really can't live without it anymore and I suggest it to everyone. I apply it with my sigma highlighter brush (holy grail) and it's pure magic! Nothing not to love about this palette! Really love it! I bought this over a year ago & I still have a lot of use left in it. Which makes it well worth the price.The colours are beautiful and I do feel the highlighters last for as along as I need them to in the day (saying that, I don't wear make up everyday and my full face is really only for social occasions like once a week). The only improvement I would make is maybe being able to buy the highlighters separately. I really don't use the bronze so I'll need to buy a whole new palette just for the ones I do use. But I still would buy it again though! I have the bronze sands edition and I am so impressed. Some Huda products are hit or miss. This is a big fat hit. When I received the palette it had instructions and I was dubious about using the bronze ‘contour’ colour as an actual contour. However, it actually works amazingly. I’m obsessed. It’s just the right shade of cool bronze for it to work. Unusual. Follow the instructions you can’t go wrong. Using the cream colour helps blend it together and make it glide on smooth. It’s easy to want to skip this step... but it’s beautiful. This has been my summer staple. I will definitely buy golden sands for the winter months. Love the texture smooth and creamy, stays on longer. Each one of them is so shimmering and different. Just love it! At first, it was a bit confusing but once I figured it out it's amazing. Its best if you put step:1 or any cream highlighter under the step:2 and its BLINDING. I also love applying the bronzed shade on top of my matte bronzer. I love it. I have the Golden Sands edition because I think it is quite universal in colors. It looks beautiful on the skin. I would not bronze with the bronzer color, it is a pure golden highlighter for me. If you apply it the way Huda beauty promotes, the results are amazing. I gave this a 5 based of my evaluation of the product as a beauty buyer, because I'm not a makeup addict myself but I had to be fair in judging the product in terms of quality, pigmentation, and it does highlight the face nicely, it was just a bit difficult to get a personal review because its a bit too advanced for my taste in makeup. i was so so excited to try this, and I was so so disappointed. I don't know if it's just me, but I feel this highlighter really builds up in one place and doesn't blend or diffuse onto the skin evenly, I use it very rarely. It just doesn't work for me. The most amazing product I've ever purchased. Really good and I feel like I could glow all day and night !!!! Best highlighter palette EVER. I love this palette so much, it's really giving me that 3D highlight effect. The powder highlighter in the palette looks like skin, there are no glitters or chunks at all. It looks and feels like butter on your skin. I wish she'd came out with individual highlighters. Huda Beauty liquid matte gloss is just wow it’s unbelievable pure matte and gives classy finish. It has stunning shades and it lasts a long time but the cream shade tends to lift my foundation and when used in the intended way - base, set, sculpt, flush it tends to look too much especially for everyday wear so isn't the most practical. I have nearly every highlighter including MAC and VB for Estee Lauder, however this highlighter is the one that gives the strongest 'strobe' highlight, you can make it natural or strong for a night out, I am completely converted. Bought Golden sands. It is the first highlighter I had so I can't compare. I only tried mary lou and this one is much stronger and more golden glow. The cream base is perfect if you apply it on bare skin without powder. Bronze shade is great do define cheeks for light skin tones, but overall the palette is not perfect and it does not make the natural look. Good for evening strong glow and it DOES last for a long time without the setting spray! Still not worth the money. Love huda beauty and I will be defo be ordering Golden Sands now. I hope the new summer limited edition will also be stocked, I cant wait! Love Cult Beauty! I will be getting a collection of huda beauty. I have the pink sands version of this highlighter palette as I have a really pale complexion. I can't tell you enough how much I adore it. I know some beauty bloggers have been saying that you don't need to use all 4 of the pans for a good highlight, but I use all four of them for a really defined highlight, it's all down to personal taste I suppose but I like my face to be princess-worthy highlight. I'm a HUGE Huda Beauty fan and would recommend all of her products anyway, but this is a quality highlighter that lasts all day and is visible. I like that it's a cream based highlighter I think it sits nicer on the skin, particularly if you have a foundation or base on underneath. I apply it with a brush rather than a beauty blender, but again, it'd work with either. I truly believe it is worth the price you pay, even though it may be a bit steep when compared to others but it can be adjusted for all different occasions/varying degrees of highlight. 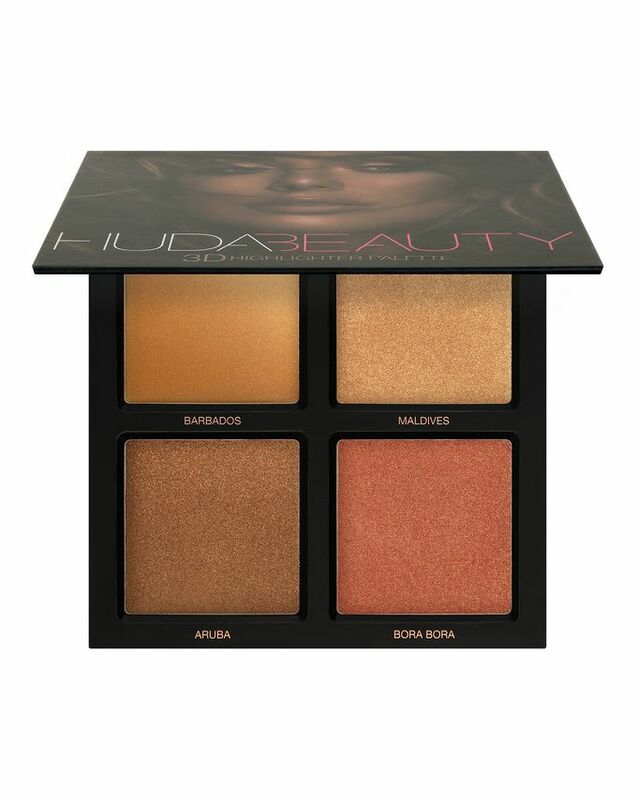 Love Hudas highlighting palette, I got the pink sands edition, the shimmer in the palette is so pigmented and it helps using the 4 steps on what area to apply inside the case. 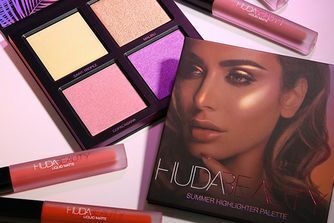 I love all of Huda's beauty range, got all of her products, love love love it. This highlighter looks so good on my skin, love it. I really enjoy using powder highlighter, bronzer and blush (although you can't really see the pink hue on the cheeks). But the cream highlighter is a bit streaky. However the rest 3 shades cover the disadvantages of the creamy one. It just doesn't look good on the skin in person, sure it photographs decently but if you want to spend £45 for photographs then go ahead. I have the Becca collab with Chrissy Teigen and it is far more superior than this. If you are after something good value for money I would go for ABH, Becca and even the Balm which is far cheaper over this. Save your money. I had such high hopes for this I bought both, but what a disappointment. What a sheer waste of money. I wish I had spent it on duplicates of Anastasia glow, Becca and Bobbi Brown. Why Huda?? Everything else you have created is amazing. You really need to go back to the drawing board on this one. So deeply disappointed. Bought thinking it would be amazing but not worth the price. When you put the bronze and blush highlight on after it makes you have too much shimmer on your face. The cream is also hard to apply without moving your foundation underneath. These highlighters palettes are out of this world. I got both colours I love them both can mix and match so many uses too highlighting, lip colour, eyeshadow blush they last all day even on busy day at work better than Mac and that is saying something. The cream does not apply smooth. It does not shine. I have pink sand and the white shade is with golden flakes. She claimed that there is not glitter or whatsoever but there is a lots of shimmer. I think the balm loumanizers can give you better results. Really makes your cheeks glow, an actually gives a '3D' effect somehow. I got Golden Sands and I never want to go back. The cream base really makes Seychelles pop, and on its own gives a pretty everyday glow. Tahiti is great as a bronzer and flawless as a highlighter for darker skin tones. And the blush is beautiful on the cheeks and gorgeous on the eye, blended out with some brown shadows, also on any skin tone. The powders are all so pigmented and not unnecessarily glittery like some other highlighters, and are blinding even in just a little natural light. A little pricey, at £40, but when you save up and get it, it's worth the wait and price. I haven't regretted it at all. Definitely saving up so I can buy it gain. I genuinely feel like a goddess in this palette. Huda did it again. This is on a whole new level! Huda has done it again. She's raised the bar with these highlighter palettes. They give you that glow from within look and stay put throughout the whole day. I'm in love no doubt. Damnnnn!! the best Highlighter I have tried, it gives a nice glow would recommend. The ultimate highlight of all highlighters. A glow that can be seen from space, without looking glittery and heavy, it literally melts into the skin. I've never used a highlighter this good in my life (and I've bought loads) It's so beautiful, blends well and leaves you glowing for hours. Believe the hype!!!!! Love this highlight. Best highlighter so far. I love the natural glow it gives on the skin; had to buy both pallets and I don't regret it. Both are amazing. Pleased with my purchase. Love these highlighters. After waiting to order this highlighter palette for a while, I was really disappointed when it arrived. Pigment isn't great. Product goes bitty and bits of glitter and a dryer looking powder finish. The cream highlighter in the palette is nice but unfortunately the rest is really disappointing. Much better highlighters out there for a lot less money and much better quality. I was first skeptical about this product but I'm so glad I bought both of the highlighter, the pigment is insane and the packaging is everything. Wow amazing product, pleased with my purchase. I ordered this directly from the Huda Beauty website and tried it for the first time today. Got the 'pink sands' edition which is supposedly ideal for my (very) pale complexion. There's so much hype around this product so I thought I'd share my honest thoughts with those desperate to get their hands on this (very expensive!) product. I have to say this pops like no other highlighter I've seen. It gives off a very very bright and beautiful glow. Although I was obsessed with the look it gave me it looks as if it's a bit over the top for everyday use, although maybe using it with a lighter hand may help, I haven't tried that yet. It doesn't eliminate the problem that all highlighters tend to have i.e. accentuating pores, but I guess it can't be expected when nobody else has achieved it. Would have been nice in any case. All in all: amazing, beautiful highlighter, hands down the best I've tried. When I had it on I couldn't stop looking at myself in the mirror, but I see myself using it as a 'special occasions' highlighter as I don't think I would pull it off at work or on a casual day out as its not at all subtle. Love this highlighter! It is so creamy and it glides on my skin. Looks so classy and shiny. Love the finish and the longevity. Absolutely love it!! Honestly, I regret buying it. The texture, color, and packaging are all so ordinary that not worth the price. I bought several different products from Huda, including eyeshadow, lip gloss, brush, and highlight palette, which are almost impossible to use except that the desert palette is a great product. I've been extremely disappointed with this over-hyped brand. I really wanted this palette. Literally dreamed of her. But it was one of my biggest disappointments in cosmetics. All products, especially blush, are not resistant at all. Yes, the colours are beautiful, yes it's a wow effect, but only the first 20 minutes. Got this as a birthday present and absolutely love it! It's so versatile, you can use it as Huda suggests, or I also like to use 'Fiji' as an eyeshadow base if I'm going for a more glowy eye look. I have a medium skin tone, and while I initially had reservations about using 'Tahiti' as a bronzer or contour due to a large amount of sparkle in it, it's actually beautiful once applied, so don't be scared like I was! All in all a great investment, you won't need to purchase another highlighter again. Nice creamy and shiny HOWEVER I don’t love. I like I use it here and there but I don’t love it. I find it’s way overpriced and overrated. These palettes are so good. Find the gold and bronze sands to be quite similar. They are very odd texture, not powdery but creamy! They work a dream and really make you glow! First I thought it would be pinker but it's not. It's more golden toned. I like it anyway. It stays on all day long and blends really good. One thing I don't like: layering the powders on top of the cream. But on its own all 4 shade is beautiful. The cream one on the bare skin really pops. Best Highlight I‘ve ever used! It’s not sitting on your skin like many highlights do it kinda sinks into your skin and gives you the perfect glow without being glittery. Another great thing is that you can build it up from settle to booooom. The cream shade is simply a game changer cause it reflects like hell! Love it! I received this palette as part of the Cult Beauty Goodie Bag (and was a big part of the reason I wanted to get it). I love the colours and the beautifully subtle effect they give my skin. However, I don't know whether it's added fragrance or just the smell of the formula, but the smell of the products make me feel very sick and make my face a tad itchy. And it feels like such a waste! This palette is magnificent. Thanks a lot to Huda for such an incredible product and thank you Cult Beauty for fast shipping. Best highlight I have used. Bought all three of them and it is the best money I've ever invested. I love this highlighter so much. It gives you a beautiful, subtle glow, makes your skin look silky and just gorgeous. My skin is fair, and this palette has perfect shades for this type of complexion. Go for it, you will love it. I bought the golden sands one and I love the shine, it's not too glittery which I love but if you wanted it to be you could pack a bit of product on.. Sadly I have to say, this is not what I expected. As an avid Huda fan, I was so looking forward to this palette also but sadly it did not deliver for me. I have a fairish to medium skin tone, depending on the time of year of course, which led me onto purchasing the Pink Sands Edition. I feel I have to agree with Freelance and NoBuy on this one, all four shades on my complexion all seemed much of a muchness really. Meaning that they were all relatively the same. And left my face looking like I've gone a bit over the TOP. Like A 1980's Novice on the highlighter. I love love love this product. I have purchased bother highlighter palettes and I have to say I love them both but. If I had to choose one it would be the pink sands, even though I'm not fair as it's supposed to be for people with fairer skin. If you like your highlighter to stand out I would recommend purchasing the pink sands. My fave highlighters at the moment. I love how fast I got my delivery and am so in love with this highlight as am fair skinned. I purchased Pink Sands and I'm in love. The pigment is unreal. That glow is so natural it sinks into the skin beautifully. Packaging also really good. Love it. I had such high hopes for this item when it was announced and couldn't wait to get my hands on it. But boy was I disappointed. The colour range for the Pink sands, well first of all the 'prep' was too dark for the first base, so it instantly darkened the whole look even after apply the lighter shades. Important to note I am not a huge fan of Cream bases though, because for me I prefer to set my whole face with powder and then apply highlighter towards the end, so the whole cream formula just messed everything up for me and made it look patchy. The blushers look pretty much the same for both palette, probably one is darker but not much difference. Pigmentation wise, they did show but I found it was not finely milled enough for a natural look. All in all I'm not too happy with these palettes especially for the price paid. I bought this palette (gold sand edition) the first day it landed on Cult Beauty, I have to say I am obsessed with this product. Huda Beauty really knows what she's doing. Each colour can be wear individually and really beautiful but if you follows the steps, it will definitely make you glow from within. I also love the fact that it's not at all glittery or shimmery. Worth every penny! I ordered this palette for my birthday, and sadly it arrived broken, so I wrote an e-mail to the customer service. The response was quick and very polite and they try their best to help you. And they send me a new palette. Never buying somewhere else. The palette is nice, but it enhances my pores a little bit so you have to work with a primer. The first 'layer'(?) of the product is not soooo pigmented, but if you have used it some times it gets better. Guys this highlighter palette is amazing. Huda has raised the bar for all other highlighter palettes out there. Highly recommended. It lasts all day and feels smooth on the skin. I know this product is on high demand right now, but trust me, it is worth the wait. This highlighter pallet is sooo good. Love how it melts on my skin. The product is so well made; it's not chalky or tacky and I have used it as an eyeshadow. I recently bought the pink sands edition and I have fallen in love! It's unbelievably pigmented and isn't overly sparkly but still achieves a perfect highlight... not to mention the beautiful packaging!!! It's very yellow toned when using the base and it also had a funny chemical smell. It's ok, but not that great. The best highlighter in the world. Many thanks Cult Beauty super service faster shipping and have Huda eyelash goodies. I am overjoyed. Thank you very much. As a makeup artist I am constantly looking and purchasing new makeup and have a highlighter obsession. I own the Huda eyeshadow palette which I love so had high hopes for this. I purchased the shade Golden Sands and have light/medium skin tone and thought this would be good for my makeup kit. Product came quickly but having now used it twice I really don't like it. If you set your makeup with powder and want to use all 4 shades the cream will instantly start separating, so you have to apply this before any powder which then means you can't powder over the top of it because it looks really messy. The colours are all wrong and do not sit or blend well on my skin. The product comes out quite 'bitty' and doesn't look smooth once applied. Save your money and purchase a Becca or Anastasia highlight palette which is the best I've used so far. So disappointing. Love it I got both of them. Oh my god, this highlighter is AMAZING. I received mine in one day. It's so pigmented and lasts all day. It is really nice highlight palette. But if you want really nice glow it is necessary to use the cream highlighter at first. One of the greatest think is that it does not emphasize my skin’s texture. It’s overly hyped, I've got cheaper highlighters that are better. When you buy Huda you should only expect the best. No negative points about this palette.